I was searching for some documentation about MDS errors and I came across this online help Oracle® Fusion Middleware Performance Guide 11g Release 1. Just check this out, dont know how long this page will be available ( it is beta). For example you can use this console logger in your JDeveloper 11g application. It opens automatically when you start your web application. 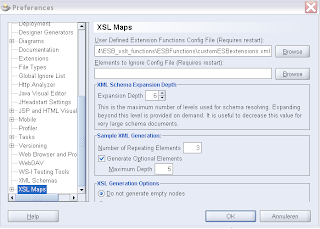 Sometimes in an ESB routing service based on a WSDL, I want to retrieve data from the SOAP Header so I can use the xml signature in the xlst transformation. Oracle has made some xslt functions so you can retrieve data from the request header ( for more information see this presentation ) . These XSLT functions can only return the values even when you use xsl:copy-of. So let's make our own XSLT library. First I start with a java class which returns the whole soap header, this class need to have static methods. This class need the oraesb.jar to complie, this is located at your soa suite home. Make a jar deployment profile and put this jar in the extension folder of your JDeveloper ( jdev\extensions ) and restart JDeveloper. Next step is to make a User defined extension function config file. This file is a xml where we register our getHeader method. Because this getHeader function give me the escaped soap header back, Let's transform this to xml with a litte help of the parseEscapedXML function. 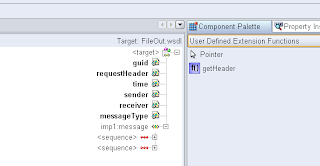 Now we only have to put our jar with our getHeader function on the soa suite server. Put the jar in the applib folder of the soa suite container. Last step is to add the jar to the system.xml of the soa suite container. 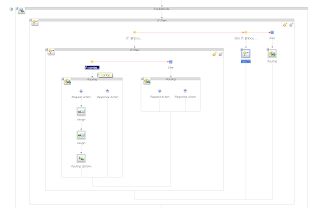 Add the jar to the oracle.bpel.common shared library entry. 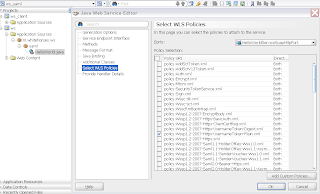 In JDeveloper 11g and in the Weblogic 10.3 Console it is easy to add a security policy on a web service. But calling these services in a web service client is a different story. 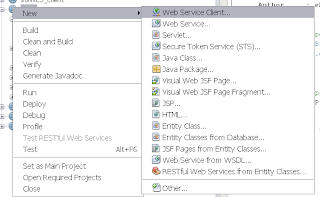 So far there is no support for these policies in web service proxy client wizard of JDeveloper 11g. Gerard Davison is doing a great job by making a lot of blog items how to do this programmatically in JDeveloper 11g. But lucky for us there is an alternative. 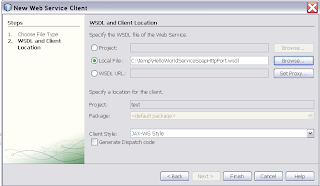 With a little help of Netbeans and Metro it is not so difficult to call these webservices with Wssp1.2-2007 policies. First we start by making a JAX-WS Web Service and adding a policy. The Helloworld Web Service with HTTPS and plain username policy which I use in this example. Deploy this on a Weblogic server and make sure the HTTPS port is working. 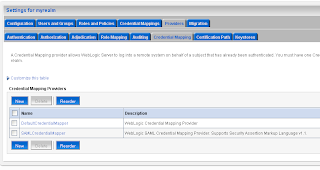 See the keystore / ssl tab of the Weblogic server configuration. Now we can download the latest Netbeans ( I use version 6.5.1 ) and Metro 1.5. Install Netbeans and add the latest Metro jars to your Glassfish 2 server. ( use ant & metro-on-glassfish.xml for this ). The Weblogic 2007/02 policies are using 256 bits encryption, so we need to download the Java Cryptography Extension (JCE) files and install this on every JDK we are using. 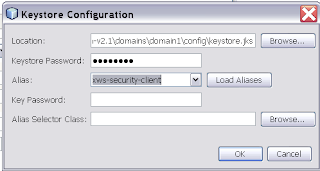 The last install step is add to the wsit demo keystores to the glassfish server. 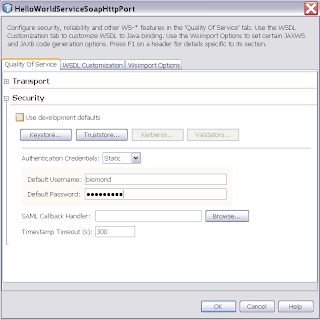 Step 1 is to download the WSDL of the Helloworld Service. Else the Netbeans wizard won't detect the policy. 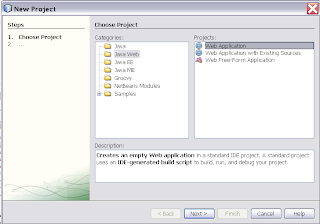 Deselect "Use development defaults" and provide a Username / password of a valid Weblogic account. Select for the private key which will be used in the encryption. 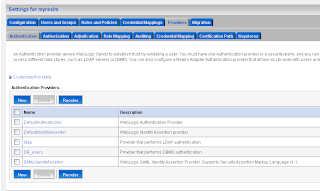 And the select the public key of the Weblogic server certificate. That's all , it should be working now. For more policies examples see this url , there are some nice examples about Secure Token Service STS. 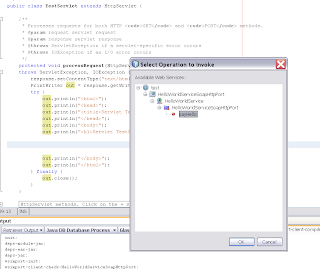 I am happy Oracle has bought Sun, let's integrate everything to one IDE. 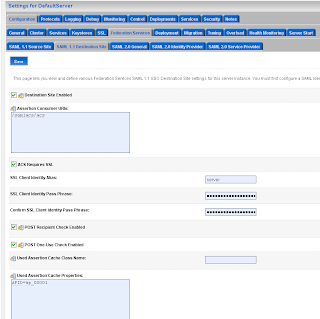 Create a new relying party for the ADF Security Application on the SAML source site. And change login-conf in the web.xml of the ADF Security Application so it uses certificate auhtentication. The only thing that isn't working yet is the redirecting to the success url after the succesfull authentication by the ADF Security servlet. 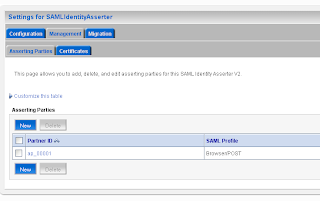 With Weblogic it is relative easy to setup Single Sign On between Servers who has support for SAML. 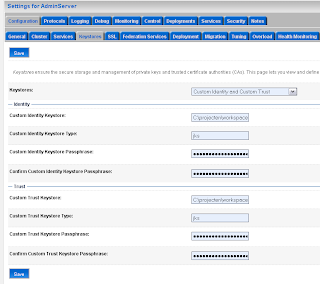 In this blog I will show you, how you can setup SSO between two ADF applications on different WebLogic servers. Off course you can also use Remote Task Flows for this, but when you setup SAML you can use this to protect your web services or use it for identity propagation with OWSM in combination with ESB, BPEL or OSB. This blog is based on the article of Vikrant Sawant where he did the same with two WLS 9.2 Domains.I will use this blog as the starting point for my next blog entries, I am thinking about the following blog entries, How to use SSO / SAML with ADF Security , SAML with OWSM / OSB / ESB and BPEL. In this blog entry I will use the standard container security. To make this work we need to have two WLS domains. 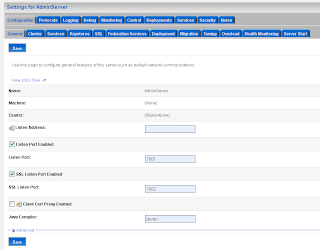 I created a new domain with the configuration wizard of JDeveloper 11G and enabled the ADF option on this domain. 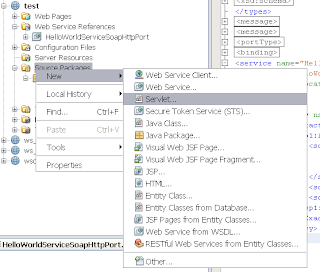 I use the internal Weblogic domain of JDeveloper as the secondary domain. If you use your own keystore then you propably have to set the new private key alias. Add a SAML 1.1 source site at the Federation Services tab. The second step on the SAML Source site is to configure the myrealm security domain. In this step we start by adding a Credential Mapping. In the provider Specific Tab of the just created credential mapping we have to define the details. Add the url of secured page ( the url of the second application ) and the https port of the SAML destination url. 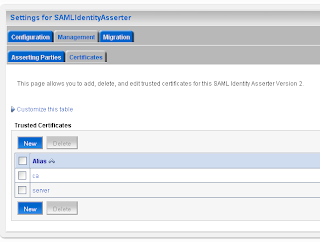 Here we also have to provide the assertion id of the client SAML. This is APID=ap_00001. We will create this later (asserting party ) on the destination SAML domain. For the communication we need to import the public keys. In my case is this the ca and the server public key. Just export these key from the keystores and rename these keys to the der file extension. 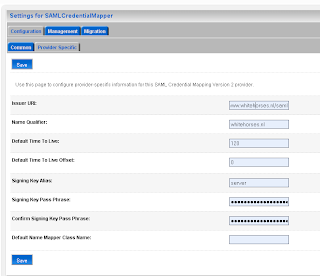 Step 3 is to setup the SAML destination site. I will use the internal Weblogic domain of JDeveloper for this. Default JDeveloper uses port 7101 and in this domain we also need to enable the SSL port ( port 7102 ). Next go to the Federation Services of the server instance and enable SAML 1.1 destination Site. 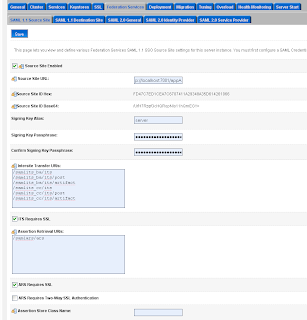 Go to the myrealm security domain and add a new SAML authentication. Add a new asserting party. Here we add the url of the application which run on the source site. And the id of the relying party on the source site. Here we also have to import the public keys of ca and server. The last WebLogic step is to add a common authorization provider on both domains. I use a LDAP or a SQL authenticator for this. Both WLS domains need to have the same users and groups. 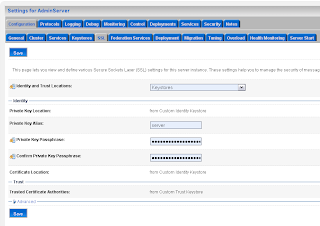 We are finished with the WebLogic configuration. Now we can make two ADF applications. For these application I will use the faces-config.xml and not the unbounded task flow. And I use the standard container security and not ADF Security. 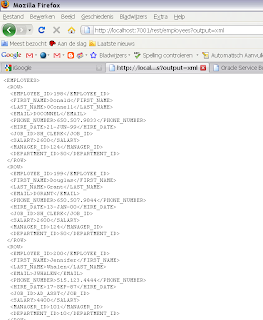 the web.xml of the source application looks like this. 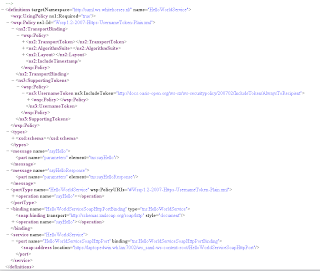 the weblogic.xml of the source and destination application ( to map the valid-user role to the wls user group ). 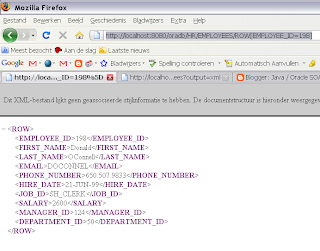 the web.xml of the destination application, now we have to use CLIENT-CERT. When the user logs in on the destination site then it will automatically redirected to the source site . Inspired by an article RESTify your world..of Emiliano Pecis, I decided to make my own OSB Rest service which can return XML and JSON. 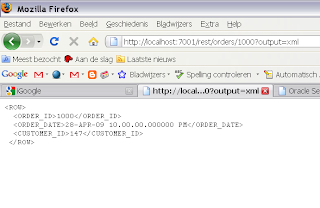 To make this work I will use the XMLdb oradb servlet of the Oracle database. T o transform the oradb xml output to the JSON format I used the JSON-LIB libraries. Here some pictures of the OSB rest service. Before we start we need to setup de Oracle Database. 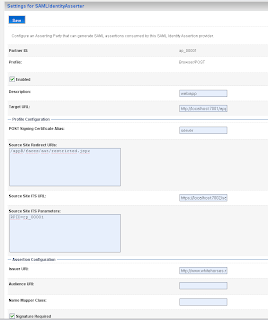 Login with sqlplus as xdb. Now we can set the http port of XMLdb. 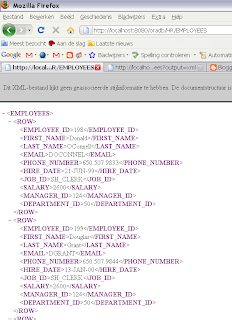 Give your Oracle schema's rights to the oradb servlet. For example the user HR. We can test this by using this url http://localhost:8080/oradb/HR/EMPLOYEES , you will need to authenticate so use the HR account for this. The output would look this. Now we are ready to start with the OSB. 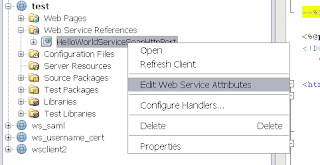 First create the Business services where we call the XMLdb servlets. 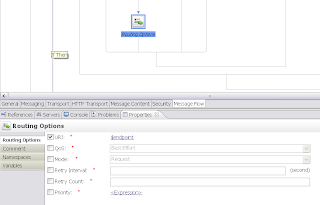 Select any xml as input and http as transport. We need also to create a Service Account with the hr username / password and add this to the Business service. The next step is to create the OSB Proxy Service. Select messaging as service type and as use text as response messaging type( because we want to return something, else you will get some errors). The transport is http with as endpoint url "/rest". In the message flow we add a Routnode with some If-then. because the first thing we need to know which type of data is requested. For example employees or orders. In the second If-then we need to know if all the employees are requested or just one. If all is requested then we can call the HR Business Service. If not then we need to retrieve the requested Id and rewrite the endpoint url of the HR Business service. You can achieve this with a routing options component. The incoming part is ready, we can focus now on the output. Here we have to create a Pipeline Pair. 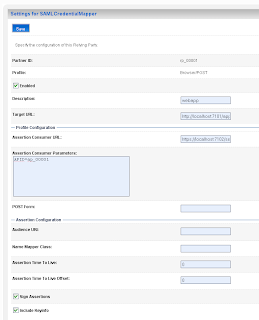 In the request parameter we need to retrieve the request url and the parameters. To get the url we can use. $inbound/ctx:transport/ctx:request/http:relative-URI/text() and the get the requested output we can use $inbound/ctx:transport/ctx:request/http:query-string/text() . These parameters will be used by the java callout. 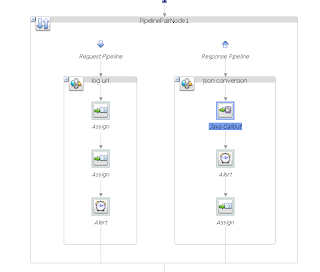 In the response pipeline I will add a java callout. This java code transform the XML to JSON. To succesfull use a java methoud in OSB, it need to be a static method and because I need to process the $body variable, I must have a org.apache.xmlbeans.XmlObject method argument. 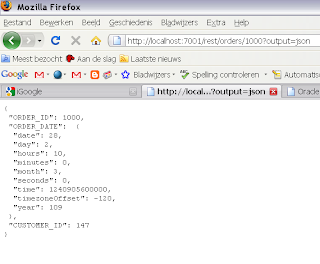 The JSON output can return output with datatypes, This datatype information isn't provided in the xml output of XMLdb so I made a convertor class for employees and orders. To make this work I use java reflection. here is a fragment of the code. The convertor of the employees request looks like this. In JDeveloper 11g I made a jar deployment and add this jar to the OSB project. Together with the required jars. Our json jar need a reference to the json-lib and the json-lib need a reference to the other jars. That's all just deploy this to OSB server. Here is my OSB export jar and the JDeveloper java callout project.